The Pope has accepted the resignation of Dr Séamus Hegarty it has been confirmed today. THE POPE HAS accepted the resignation of the Bishop of Derry Séamus Hegarty, it has been confirmed by the Irish Bishops’ Conference. Dr Hegarty tendered his resignation earlier this month citing ill-health and Pope Benedict XVI has confirmed acceptance of this resignation having viewed medical reports. The resignation came into effect at 11am this morning. As the Derry diocese is now vacant, the Pope has requested the Diocesan College of Consultors, a group of eight priests who govern the diocese collegially for up to eight days, to meet and elect a Diocesan Administrator in the interim period. It is the fourth Irish diocese to become vacant with three other bishops already having passed retirement age. There are 26 dioceses in Ireland. Email “Bishop of Derry's resignation confirmed by the Vatican”. 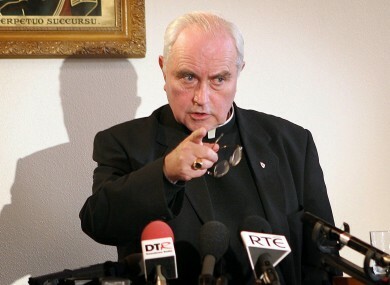 Feedback on “Bishop of Derry's resignation confirmed by the Vatican”.